Mammut Runbold HS Thermo Hooded Jacket. Hard shell, warm core. With a combination of wind- and waterproof 2-layer DRYtechnology Performance material, a water column of 20,000 mm and impressive vapor permeability, the Runbold HS Thermo Hooded Jacket is ready for any mountain adventure. 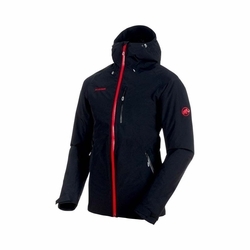 It is suitable for alpinists, trail runners and high-altitude ski-tourers. The Ajungilak OTI Element padding on the torso and arms fulfills its insulating shield function against the cold even on wet days. The waterproof Aquaguard front zipper also prevents moisture from reaching the body.